To enroll a student who has not attended school in the United States or a U.S. accredited school during the previous two years, parents must first visit the International Admissions and Enrollment office. Otherwise, parents should contact their local school. Proof of identity for you and your child. This can be a birth certificate, passport or other legal document. Proof of your relationship to the child. A document showing that you live in Montgomery County. Proof that your child has received certain immunizations. Academic records from your home country. At the International Admissions and Enrollment office, documents are reviewed and a home school is assigned. Grade and course placement recommendations are made after examining the student’s academic record. Then, the parent and child visit the county health clinic where health records are reviewed, vaccinations may be given, and an immunization certificate is issued. If needed, an English Proficiency Assessment is scheduled. To finish the registration process, parents must contact the registrar at their child's local school. 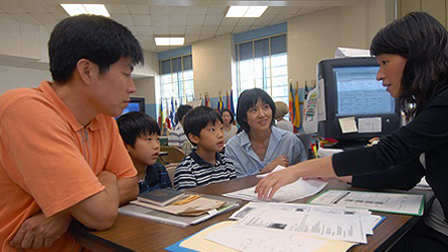 If your child has not attended school in the United States during the previous 2 years, you must first visit the International Admissions and Enrollment office. You will need proof of identity for you and your child, proof of your relationship to the child, and a document showing that you live in Montgomery County. You will need proof that your child has received certain immunizations. At the County Health Clinic, health records are reviewed, vaccinations are given, and immunization certificates are issued. English Proficiency Assessments are scheduled at the International Admissions and Enrollment office. During the meeting, documents are reviewed and placement tests are scheduled. The registrar will also discuss school rules and fees, transportation options, and help set up a food account. If your child has not attended school in the United States or a U.S. accredited school during the previous 2 years, you must first visit the International Admissions and Enrollment office. To use the free school bus service, students must live a certain distance from the school. Elementary school students must live at least one mile, middle schoolers one and a half miles, and high schoolers more than two miles away from the school. Exceptions are made if students face hazardous walking conditions. When first enrolling at school, students will receive school bus information, including where each bus travels and their bus route number. This four- digit route number is located on a black and white sign on the bus's side window, near the front. It is NOT the number painted on the bus. All students are expected to follow the rules when riding the bus. Many schools run after-school "activity" buses several days each week. The activity bus may drop off at different locations than the regular bus stops. Students should memorize their home address, and know where the activity bus will stop. MCPS schools offer breakfast and lunch, and students can either purchase meals at the school cafeteria or bring food to school. Students will set up an account to purchase food when first registering at school. This account has a personal identification number (PIN). When purchasing food, the student must enter the PIN on a keypad, or scan his/her school photo ID. That allows the cost of any food items to be subtracted from money in their account. Deposits into the account can be made by cash or check by students and parents, or through the online system. Parents who can't afford to purchase school meals can apply for a program that allows students to get lunch and breakfast for free, or at a low cost. Qualification for the program is based upon family size and income. An application will be given to parents when first registering their child at school. Participation in the program is kept private. If a student has allergies or special dietary needs, parents should talk with the cafeteria manager and school nurse. If a medical condition is involved, the school nurse will provide a form to be completed by the child's doctor. In MCPS classrooms, students interact frequently with the teacher and with each other. Students may work in small groups, which may be different from classes in some countries where students are expected to sit quietly. Schools are communities, where positive and respectful behavior is expected. In Montgomery County, parents can participate in their child's school by attending parent-teacher meetings, joining the Parent-Teacher Association, volunteering in classrooms, helping teachers during field trips, or volunteering at other student events. Middle and high school students receive a hallway locker at school to store backpacks, coats, books and school supplies. Lockers are small, so what students can put inside is limited. The locker is opened by using a series of numbers, and students will be shown how to open the lock and given an opportunity to practice. A student's locker is secure, but school staff are allowed to enter lockers without a student's permission if there is a real need. The lockers belong to the school, so there is not an absolute guarantee of privacy. Students should not put anything inside their locker that would put themselves or their friends at risk. Students also get a Physical Education locker when taking PE classes. Students taking physical education classes are required to change into athletic clothing. PE lockers hold the student's regular clothes and other personal items during PE class. At MCPS, most schools view homework as an extension of the school day. Assignments relate directly to what students are learning in class. They give students a chance to practice skills, extend learning, demonstrate knowledge, or prepare for an upcoming lesson. For very young students, completing homework takes just a few minutes — up to about an hour when students reach 5th grade. In middle school, the amount of homework grows to one or two hours each night. And in high school it grows even more, depending on the courses one takes. Parents should make sure students have school supplies at home, and a place to concentrate and complete homework without distraction. If a student can't complete an assignment, he/she should contact friends, ask family members for support, and take advantage of the resources provided by MCPS, and Homework Hotline Live. Students can contact the Homework Hotline and get personalized help through the website or by watching the show on television.